How would you like to win a $50.00 Restoration Hardware gift certificate?? 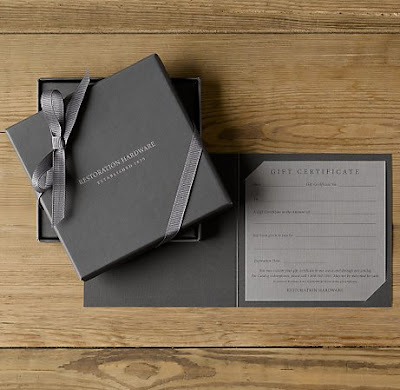 before 5 pm eastern time on Friday 1/13, sign up with app smitten you will be entered to win a $50.00 Restoration Hardware gift card! Just think of all the things you could buy! There are so many great apps for your i-phone or android and finding them couldn't be easier with app smitten. Get the apps you love delivered right to you inbox! To enter this giveaway, you do not need to leave a comment here. Instead head on over to app smitten! They will pick a winner on or around Friday 1/13. How cool is this! Love the giveaway and the site. It's Marianne from White + Gold Design. You posted about my remodel and I wanted to thank you properly, but I cannot find your email anywhere on your site. Would love it if you could give me your contact info. Thanks and what a great blog! You are very talented with such a great eye. I wish I can enter and win the giveaways. Happy New Year! I would love to win this. Hope it's not too late!